Parents who does the school run — drop off and pick up — daily will understand the frustrations of navigating their vehicles through tight spots and trying to stay patient in the queue before some idiot decides to cut in and all hell breaks loose. These scenarios are particularly prevalent on the first days of school when new primary one parents unschooled in the school system disrupt the pick up/drop off process. Inevitably, tempers will flare and fights ensue in and outside the school grounds. No, it is not the students or the faculty but parents in their cars and the traffic police. The Conflict? Where are parents allowed to park while waiting for their school-going children at the end of the school day and the management of traffic congestion around the school. As parents, we just want to pick up our kids and take them home for lunch or dinner. We don’t want to incur fines, or flout any traffic laws. Planning and plotting our path of pick up is stressful enough; we really don’t want to fight with anybody. This really puts a damper on our day. We are already known as a nation of unhappy people; we really don’t want to perpetuate this fact further. We understand the traffic police’s duty to ensure that traffic is smooth sailing and we will like to cooperate with them. However, we also would like to seek their understanding and compassion especially on the first days of school while we try to figure out the best way to retrieve our children from school without stepping on anybody’s toes – the school, other parents OR the traffic police. Please don’t be so quick to fine us. In some schools where parking area is particularly scarce, we parents will really appreciate some latitude from the traffic police. It will be helpful if the school or the traffic police can advise parents the area around the school where waiting and parking is acceptable. 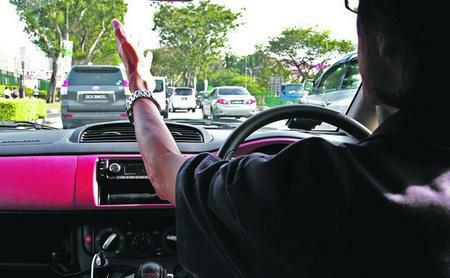 Telling us where we cannot park at every juncture just leaves us frazzled and panicky, especially if we have young children waiting for us to fetch. Giving us a fine will only compound the ill-feelings towards traffic police. Why not try a little compassion and understanding? Traffic congestion around the school is a complex issue that has to be dealt with delicately. But I’m sure kindness during this time will go a longer way in resolving this difficult conundrum than fines. This post was first published in Today Singapore, 8 Jan 2013. It was also republished on The Real Singapore. On the day that my article was published in Today, I received a summons ordering me to pay a fine of $70. Subsequently, I wrote an appeal letter to Land Transport Authority (LTA) and the fine was revoked. Whew!